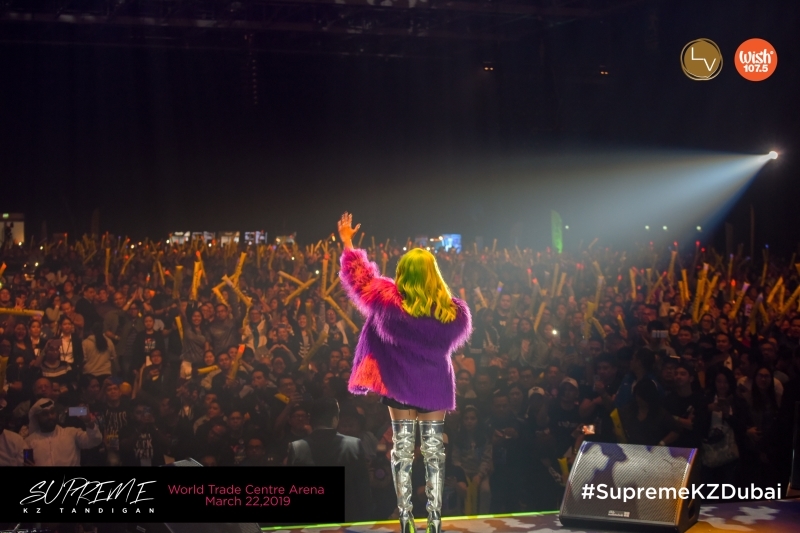 Asia’s Soul Supreme KZ Tandingan brought her A-game to Dubai as she delivered an electrifying and emotional show for the first international leg of her “Supreme” concert series on March 22, Friday. 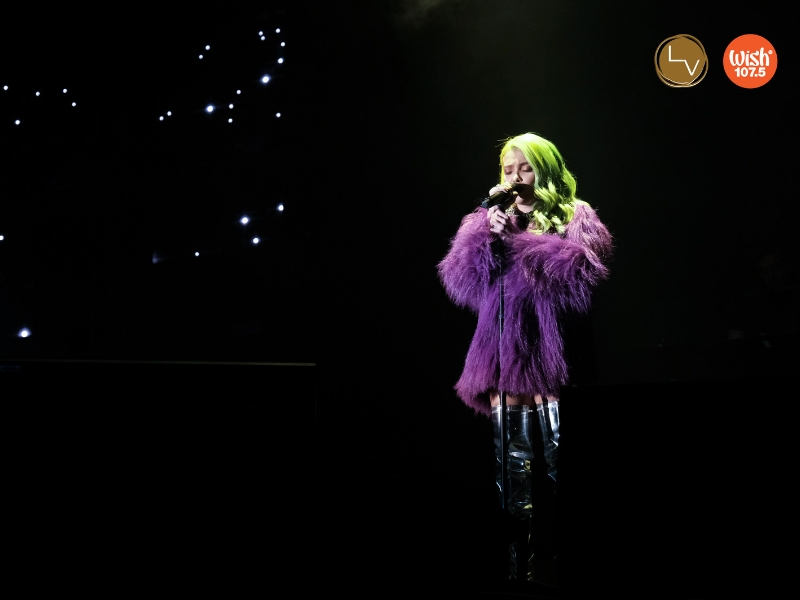 Rocking a violet faux fur coat-silver boots number spiced up with her neon green hair, the OPM star made history as the first Filipino act to have performed at the Dubai World Trade Centre Arena — with a capacity of 8,500 to 10,000. “When I was told that this concert is the first-ever Filipino concert at the Dubai World Centre, I really became nervous… But I was surprised when they said earlier that we are sold out,” she thrillingly remarked. “Tonight, Filipinos made history. 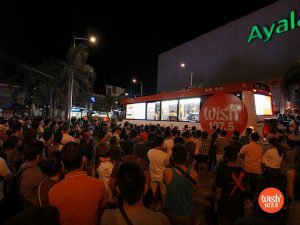 You are part of history,” the 27-year-old artist further told the crowd. Tandingan’s first song for the evening — a show-stopping cover of Demi Lovato’s “Confident” — perfectly reflected the total performer’s mien; her bold musicality expressed her determination for her audience to have the best night of their lives in her landmark Dubai concert. Highlighting her well-praised musical versatility throughout the show, she churned out her hit tracks and wowed the crowd with revivals she made entirely her own. KZ Tandingan shares an intimate moment on stage with special guest and real-life partner, TJ Monterde. 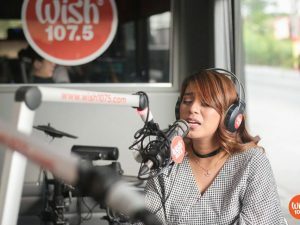 Her setlist included her 2017 smash “Labo,” a piano-driven version of UDD’s “Tadhana,” a soulful arrangement of Imelda Papin’s “Isang Linggong Pag-ibig” (which also showcased her equally talented tourmates or “Team Supreme”), her rap-injected take on Lorde’s “Royals,” and her emotive version of The Carpenters’ “Close To You” — which she made more stunning with a saxophone embouchure (or the use of one’s mouth to mimic sax sounds). Apart from her solo production numbers, she also performed with A-list guests for her sold-out concert. Acoustic heartthrob TJ Monterde and Tandingan did a medley of the dramatic Coldplay ballads “The Scientist,” “Yellow,” and “Fix You.” Meanwhile, Philippine R&B King shared the stage with the Soul Supreme and gave a smooth spin to Bee Gees’ “How Deep Is Your Love.” Both guest performers also dished out their respective hits. In the nearly two hours where she performed, six songs featured her sharing the spotlight with a member of the huge crowd. In “Till My Heartaches End,” she invited Filipina actress Maja Salvador to join her for an impromptu collaborative performance of the ‘90s OPM tune. Following it were her heartfelt renditions of “Ikaw Lang Ang Mamahalin” and “Two Less Lonely People In The World,” which she sang with two lucky audience members. 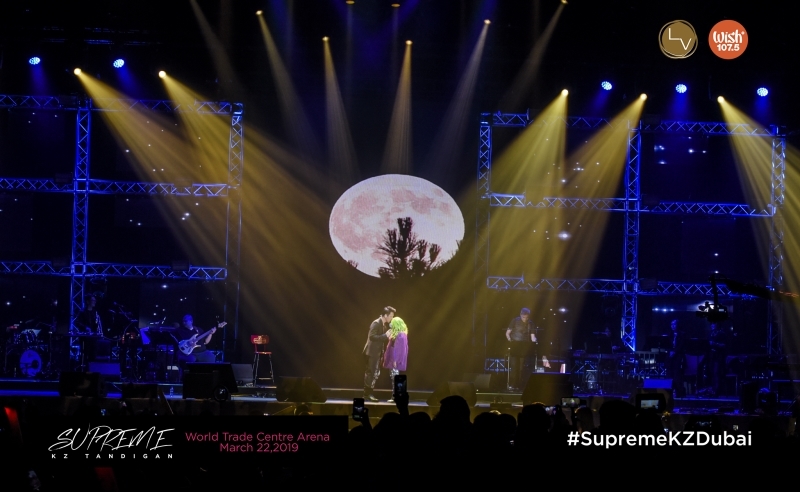 In one of the more poignant portions of the night, the OPM songstress was joined by a talented, teary-eyed attendee for a stirring duet of “Wag Ka Nang Umiyak.” Tandingan dedicated the Sugarfree original to the hardworking Overseas Filipino Workers in the United Arab Emirates city. “I really appreciate the sacrifices you make. Not all people can do what you are doing, so I dedicate this song to all of you to remind you that we will always love you no matter what. You guys are always appreciated,” she said. KZ Tandingan performs her hit song “Mahal Ko o Mahal Ako” with an Emirati blogger. 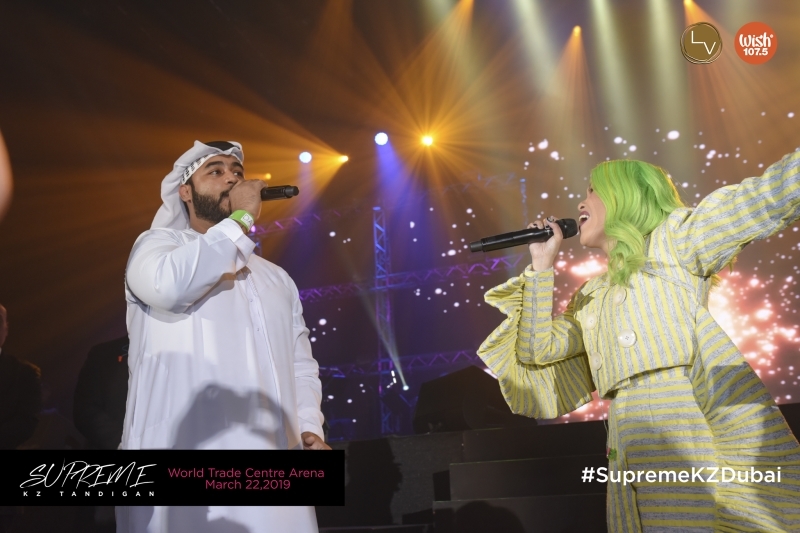 The “Supreme” show also became memorable for an Emirati blogger, who got to perform “Mahal Ko o Mahal Ako” with Tandingan. During the latter part of the show, she also called Gab Maturan, another celebrity concertgoer, to help her deliver a fiery performance of the Shanti Dope-hit, “Nadarang.” Both are products of X-Factor Philippines. While Tandingan was declared grand champion, now-Dubai-based Maturan won first runner-up. Last Friday’s concert was supremely entertaining. At one part, audience members were left in awe when Tandingan thanked the event’s presenters and sponsors in a true “Soul Supreme” fashion — she sang the spiels, complete with intoxicating runs. But comical antics and adlibs aside, her sincerity was evident as she acknowledged the important people who have been supportive of her career, especially her parents who are based in Davao City..
“If only my parents were here to celebrate my sold-out concert in Dubai, I would hug them; this is their dream for me,” she said, recounting how ecstatic she is to perform before a huge crowd. 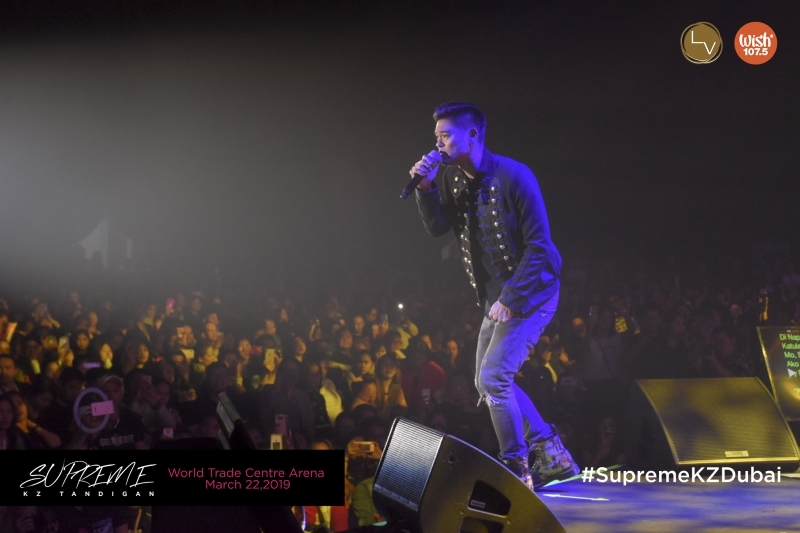 KZ Tandingan receives warm welcome and support from Dubai fans during her “Supreme” concert. The “Supreme: KZ Tandingan” Live in Dubai is presented by La Verdad Events Management and Wish 107.5 , co-presented by NOON.com. Supreme’s official airline partner is the Philippine Airlines and its official bar partner Datu Club. Supreme is presented in part by Airlink International UAE, Kabayan Cargo of Airlink, Uling at Parilya, Carinderia ni Tandang Sora, Cancios Restaurant, Ahlan Services, Magic Star Karaoke, Bulwagang Filipino Restaurant, Zabeel Printing Press and Royal Regis Travel and Tours, Petals by Carmille, and Day to Day. 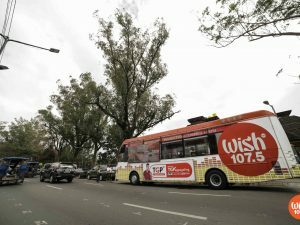 We would also like to thank our Media Partners UNTV News and Rescue, Expat Media, Pinas Music Zone,Tatak Pinoy Loud and Proud and The Filipino Times. Special thanks to Hair Designer and Makeup by Mau Piodena, The Style Curators Dubai, Dublog, Proud Pinoy Media, SIklab Pinoy and I am Najaa TV.